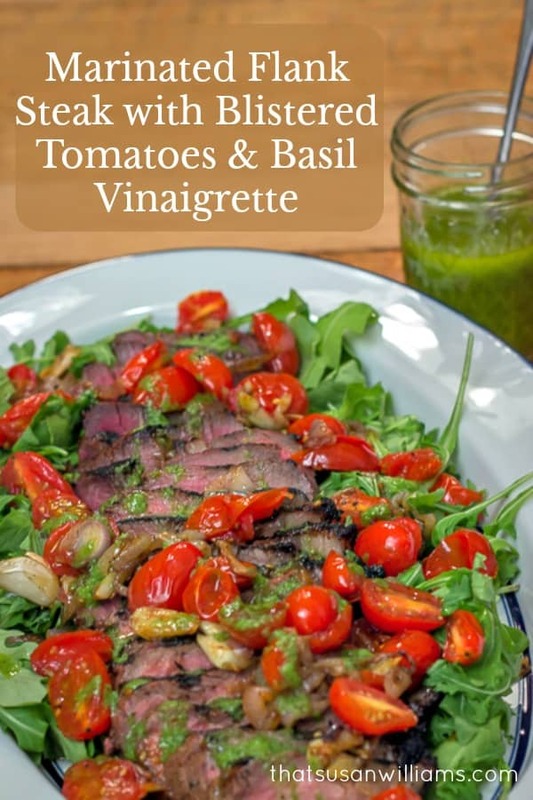 Grilled Marinated Flank Steak with Blistered Tomatoes and Basil Vinaigrette is the perfect meal for easy entertaining. 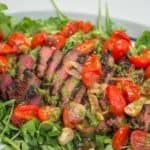 Grilled Flank Steak with Blistered Tomatoes and Basil Vinaigrette is my new favorite go-to recipe for when company is coming, and I want to serve something that is beautiful to look at, absolutely delicious, and best of all: EASY!!! Those words, “company’s coming” can strike fear into many a brave heart. I know! I hear you! I feel your pain! But never fear, my dears: I have the remedy. I have your plan. 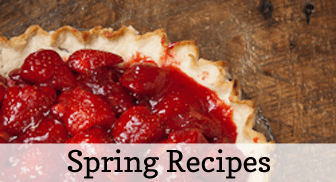 This recipe is it! 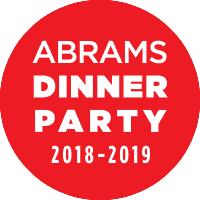 One of the cookbooks I read last year from Abrams, that I really loved, was the cookbook by the food blogger, Gaby Dalking, called “What’s Gaby Cooking?”. My husband and I both salivated over a picture from her book that showed a big hunk of steak carved into thin slices, that had been decorated with brilliantly red tomatoes, and drizzled with some kind of green, herby looking sauce. 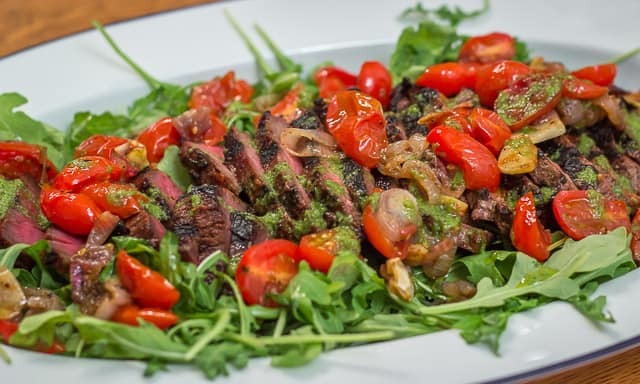 She called it, “Balsamic Grilled Flank Steak with Charred Tomatoes”. We decided it looked like a recipe worth trying. So then we decided, what if we took our marinade, and borrowed heavily from the rest of Gaby’s recipe by making her charred tomatoes, and a slightly less potent version of her basil vinaigrette? Gaby’s vinaigrette was good, but one night, I didn’t have all the basil her recipe called for, and I decided I liked the version with less basil, better than her original recipe. And then, what if we laid it all on top of a lovely bed of peppery arugula? 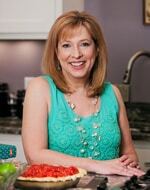 Gaby’s recipe had morphed into That Susan Williams’ recipe, and we liked ours even better. OUR marinade takes less than 5 minutes to prepare. Give your steak (whether flank, or skirt, or NY Strip, or whatever you’re using) a few hours to marinate in it. (We usually give ours between 2-4 hours). Get your husband to grill it. Follow the directions in the recipe for grilling it, whoever does the grilling at your house, but for the love of all that is holy, PLEASE don’t overcook it. Embrace the pink. The pink is flavor. Medium rare for me, if you please. The blistered tomatoes will take you all of about 3 minutes to cook. You can do them last, while the grilled meat is resting. The vinaigrette takes about that long to assemble, and whir around in your blender. Pick up a loaf of crusty artisan bread from your favorite place, to serve alongside your lovely steak. Invite the guests to pick up a half gallon of their favorite ice cream for dessert, so that they’ll feel like they’re contributing something. Or have them bring their favorite wine. That would be nice, too. And with very little effort, you can have a warm evening of fellowship, love, and laughter. Now, go forth, and do it! If you, or someone you love knows how to grill, just DO it. 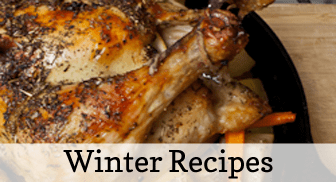 Pin this recipe (or share it with whoever you’re inviting over via Facebook! ), and invite someone over for dinner, before grilling season ends! Whether it’s someone you love, or someone you need to get to know, this is a meal plan that will satisfy everyone! Unless they’re vegetarians. The big, beautiful platter makes for an impressive display! 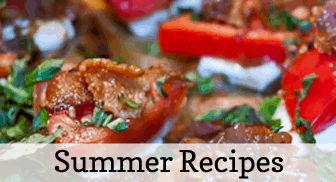 The recipe, then is kind of like 3 recipes in one: the marinade for the meat, the blistered tomatoes that can be done at the very last minute, while the meat is resting, and the basil vinaigrette, to drizzle over the whole platter. 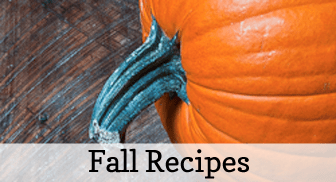 Whisk the marinade ingredients together in a bowl or liquid measuring cup. Place the steak into a ziplock bag, and pour in marinade, and seal the bag. Refrigerate, and allow the steak to marinate for 2-4 hours. Combine all basil vinaigrette ingredients in a blender, and blend for a minute. Pour into a serving container. Heat the olive oil in a cast iron skillet, over medium-high heat. Add the shallot and garlic and cook for 1 minute, until fragrant. Add the cherry tomatoes and cook, without stirring, for 2 minutes. (You're looking to allow the tomatoes to blister, or char, slightly.) Give them a stir, remove the skillet from the heat, and allow to sit for another 2 minutes. Preheat and clean the grill. Remove the steak from the marinade. Season liberally with salt and pepper. Grill the steak until lightly charred, all over, 6-8 minutes for medium rare, 8-10 minutes for medium. Remove from grill and allow to rest on cutting board for 10 minutes. Place arugula on a platter. Arrange the steak slices on top of the arugula. 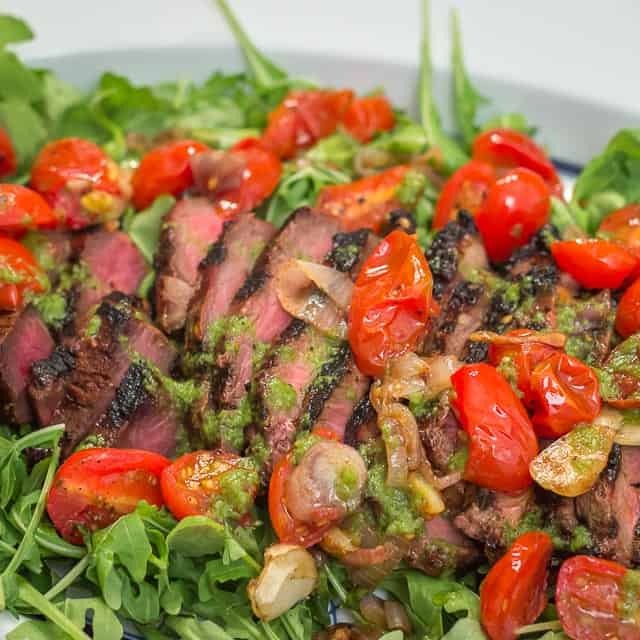 Top the steak with the blistered tomatoes, and drizzle the whole platter with the basil vinaigrette. Adapted from What's Gaby Cooking?